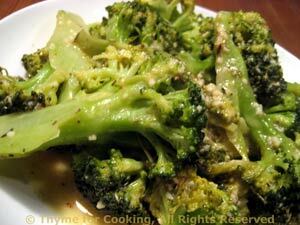 Broccoli with Mustard Sauce, a piquant vegetable side dish. Put in steamer basket in saucepan with an inch of water in bottom. Put on medium heat and steam for 15 minutes or just until done, careful not to overcook. Sauté briefly, then add mustard, lemon and stock.